Sheri is the Accounts Payable Manager for Platinum Energy Group, SNS Organization, Tradeline Plumbing and Bain Mechanical. 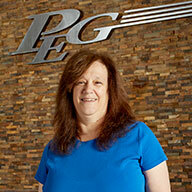 Sheri has been an accounts payable manager in the mechanical and construction industry for over 30 years. After graduate studies in Colorado, Sheri worked in accounting and computer operations in wholesale, construction supply companies for 12 years. She returned to New York in 1989 and continued in the industry. Sheri strives to be a team player and assist her CFO, accounting manager, vendors, customers and fellow employees to the best of her abilities.